Formed in 1975, we provide mechanical and electrical engineering services with the main focus on building systems. Mechanical and electrical engineering brings life to buildings, creating healthy, productive and safe environments for employees, as well as, making the space fit around the clients' needs (and not the other way around). 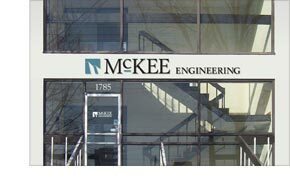 McKee Engineering understands the importance of viewing mechanical and electrical systems together, one of the key advantages of our Firm. We accomplish this through innovative design, accurate and clear drawings and specifications, and knowledgeable review of construction. Over the years, we have provided engineering services to over 1,000 clients where we have developed and extended our skills to include a wide variety of projects including Developers, Institutional (Hospitals, Schools, Post Secondary Institutions), Tenant Fit-Up, High Technology, Industrial, Government, Commercial, and Residential. For more information on our experience, see Projects. The approach of our Partners is to provide engineering services that apply the best available proven technology to achieve a reliable and cost effective solution. One of the objects is to develop long-term client relationships by providing systems that respond to client expectations at budgeted costs. This requires a coordinated effort and clear communication within the entire team. Our staff of 37 people is the Company and, therefore, the Company is committed to the technical and personal development of all personnel. Our policy is to provide training and leadership to all employees to constantly seek improved quality at reduced costs to meet and/or exceed the expectations of our clients.